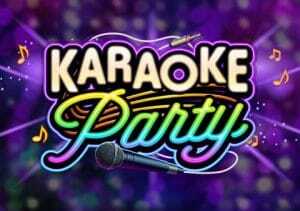 Warm up your vocal chords and get ready to belt out a classic tune or two in Karaoke Party, a 5 reel, 9 payline video slot from Microgaming. The chief attraction in this party-themed game is the bonus feature that awards up to 30 free spins with all payouts trebled. Play from between 9p and £45 per spin. Featuring an explosion of colours, the reels include 5 different groups of people you’d expect to see behind the mic at a karaoke night. Look out for the all-girl group, the all-boy group, the cheesy couple, female diva and male crooner. They’re joined by the usual array of lower value playing cards. There’s also a wild, the Karaoke Party logo symbol, which substitutes for all other symbols with the exception of the scatter. Better still is the fact that all winning combinations that include a wild are doubled. The wild isn’t the only multiplier on offer either. More value is available courtesy of the bonus round. To trigger the Free Spins feature, you’ll need to land 3 or more scatter symbols anywhere on the reels. You’ll then receive 15 free spins where all winning combinations are boosted by a 3x multiplier and trebled. If you get 3 scatters during the feature, you will receive an additional 15 free spins. On the variance scale, Karaoke Party is in the medium range – the tempo is neither frantically high nor deadly slow. You won’t be waiting ages to land a winning combination but there are still chances to win big, especially via the trebling multiplier in the free spins round. As you’d expect given the theme, Karaoke Party is a bright and breezy affair. The visuals are simply done, complemented by a bouncy soundtrack that’s right in keeping with the party theme. Karaoke Party is simple fare as far as gameplay is concerned – don’t expect much in the way of complex features. The free spins round is a good one though. Get lucky with the multipliers and this party could turn into a night to remember. It’s not the best Microgaming video slot around by any means – I recommend Immortal Romance and Jurassic Park which are superb.